Each day we drive by large posters in La Cruz advertising the fishing contest that happened in October and Kyle asks, "When are they going to take those posters down!?" 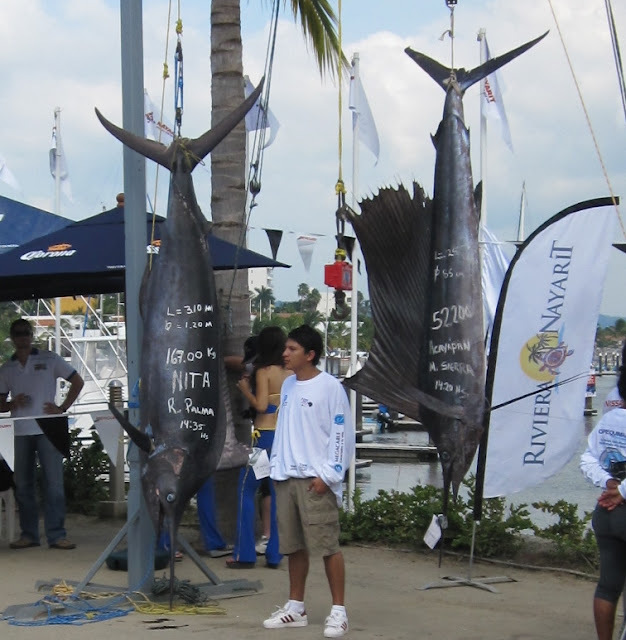 Marina La Cruz hosted a sport fishing contest in mid October. The fisherman competed to see who could catch the largest Sailfish (Pez Vela), Marlin, and Tuna. Kyle was not happy to see the posters and threatened to unfriend Emiliano if he partook in it. Luckily Emiliano didn’t have a power boat to go out in, but he certainly would have liked to have joined in. The size of the winning fish was staggering, at least for those of us who don’t usually go to fishing contests. The first place winners each took home a small economy car. Compare this to the $2.4 million dollar prize for the biggest fish at the Bisbees Black & Blue Marlin fishing tournament in Cabo San Lucas in October (winning fish size - somewhere north of 400 lbs). The entrance fee? A mere $60,000 to be in all the tournament levels each day. Another version of high stakes gambling. Our marina neighbors on the boat Journeyman told me about the Cabo San Lucas tournament. While they didn't win at the Bisbees in Cabo San Lucas, they did win a truck in a fishing tournament earlier in the summer. I wonder how much fishing Banderas Bay can sustain? There are some limits on the the number of fish that each person can catch, but I'm not sure how well it's enforced. When will they take the posters down? We tell Kyle the posters will probably be up for a long time since people will look at them and think about going out fishing while they are here in La Cruz. It's good advertising.